Lama Jampa Thaye will teach Instructions on shamata and vipassana meditation (calm abiding and insight meditation) This will be based on The Triple Vision text. He will teach this over the two days. This is a teaching that is of value to meditation practitioners of all levels and experience since it applies to practice up to the highest Vajrayana. Shamatha, Tibetan ཞི་གནས་, shyiné–the calm abiding which steadies, composes, unifies and concentrates the mind. Open to Everyone. Requested donation: $40 per day or $60 for both days. Dana (offering) to the Lama is separate. Also, Lama Jampa will introduce and sign copies of his new book, Wisdom in Exile: Buddhism for Modern Times on the Saturday afternoon after the teaching. 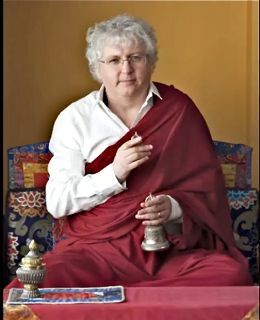 Lama Jampa Thaye is a scholar and meditation master trained in the Sakya and Kagyu traditions by his two principal teachers, His Holiness Sakya Trichen and Karma Thinley Rinpoche. Born in England in 1952, he became a student of Rinpoche at the age of 20 and met His Holiness a year later. He has been authorized by these masters to teach Vajrayana and to bestow empowerments. When Lama Jampa previously visited Ewam Choden, he taught on the history of the Rime movement and on comparing the views of emptiness in Rangton and Shangton and on the first two points of the Seven Point Mind Training, which includes the preliminaries and the actual practice of Tong-Len (གཏོང་ལེན་) (giving and taking).